It’s that time of year again. The weather is cooling down, the colors of the season are changing, but most importantly, the colors of Magic are changing as well. Black and blue were the colors from the previous season, but with rotation comes a beautiful rainbow of possibilities. Which colors will come to the forefront? Which will be relegated to support roles? What decks will be tier 1 and which ones will be tier 2? I’ve done this a few times before, and today I’m doing it again. The metagame will be broken up into 3 different strategies: Aggro (rock), midrange (paper), and control(scissors). Most people will probably be playing aggro decks in the first few weeks of Khans of Tarkir, at least until a solid control deck is developed to shut them down. While some of my ideas might seem similar to those of other writers on the internet, I promise you I’ve been working on most of these for months. During my preparation for Pro Tour Journey into Nyx, I was brewing a lot and testing decks out left and right. While I decided to end up playing Naya Midrange at the Pro Tour, there were quite a few decks that had potential but just couldn’t come together. Now that Khans of Tarkir has been released, I feel like the final pieces are in place and that the decks can finally compete. Mono black aggro was extremely strong in the early stages of block constructed. Theros and Born of the Gods alone gave it most of its power. The deck hasn’t changed too much from its block constructed form, but a few new cards from the new set really help it out. Bloodsoaked Champion gives you a reoccurring threat, and also gives you a total of 12 one drop creatures (on top of Thoughtseize). This makes the deck extremely nimble on its feet and a average converted mana cost of 1.95. All those decks playing Turn 1, 2, and 3 mana creatures are going to have a big problem dealing with the pressure you can put on the board in the same time frame. 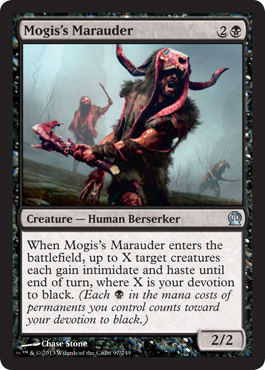 Even if they are able to get out some good blockers such as Sylvan Caryatid or Courser of Kruphix, Mogis’s Marauder will simply go around them and strike for lethal. It’s not rare for this deck to win on turn 4 or 5 (depending on how your opponent blocked). The biggest draw back of this deck in Khans standard is not having access to cheap removal like Ultimate Price or Doom Blade. Having to deal with a turn 3 Polukranos, World Eater could suddenly turn into a big problem. It’s for that reason that I decided to play with Thoughtseize instead of a Master of the Feast. 5 damage may seem like a lot, but I’d rather take that option off the table for my opponent than letting him swing with it and race me (which they would probably win because of Courser). Pain Seer seems like it will be a good card drawing engine, but I also think that Grim Haruspex deserves a spot. You’re playing pretty much all creatures in this deck, and you want to keep the pressure on your opponent no matter what and win as fast as you can. Grim Haruspex lets you attack, attack, and attack without fear of losing card advantage. Whenever one of your guys dies, you will hopefully replace him with another. He also doesn’t shy away from attack with a 3/2 body either. I packed most of my removal in the sideboard. I want to put a lot of pressure on my opponent game one and punish players for missing their land drops or misplaying. In game 2, things get a bit trickier. I originally had Atheros, God of Passage in the main board, but I thought he would be better post sideboard to deal with removal your opponent would side in. While I don’t think he would save your creatures from Anger of the Gods, he should save them from just about everything else: End Hostilities, Bile Blight, Circle of Flame, etc. I also think he won’t have any problem becoming a creature after turn 3 (barring a board wipe of course). Bile Blight and Pharika’s Cure would come in against other aggro decks, Dark Betrayal for black decks (which I think will be popular), and for control I would side in Erebos and Brain Maggot to give me card advantage over the other player. If you run into any indestructible creatures, Silence the Believers should do the job. 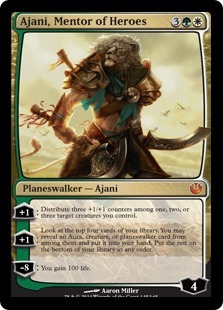 Abzan Walkers looks like a beast on paper, and believe me when I say it is one. I’ve been playing it for the last few weeks leading up to the rotation (minus the Khans cards of course) and It’s been doing very well. I had no problem in dispatching Rabble Red decks, and all the planeswalkers gave control players fits as well. The hardest part of the deck was creating the mana base, but I think I have a good handle on that now. It’s not complete, but it should get the job done. At its is the core of any good green midrange deck: Elvish Mystic, Sylvan Caryatid, and Courser of Kruphix. These cards ramp you up to a larger creature and ensure that you have mana to cast things from your hand. Polukranos is also the 10 ton elephant in the room, just because he begs to be dealt with or will take over the game. Our new tenant in Abzan walkers is Siege Rhino. It’s a sweet card that helps replace any lost life from a Thoughtseize or use of pain lands, and it also is very hard to block. There is also a distinct possibility to play it on turn 3, which in my opinion is much better than playing a Polukranos. Most people I’ve shown the deck to have said that 4 would be much better in this deck, but I simply can’t find myself to drop the last 2 Genesis Hydra. He simply gives me too much card advantage and is much better to cast at 6 mana now! The true power of the deck comes from the planeswalkers however. Nissa helps you ramp into even bigger cards after you cast her (while also supplying 4/4 bodies), Elspeth puts up a wall of soldiers to stonewall your opponent until you can ultimate her and swing in for the win, Liliana Vess gets you the card you need, when you need it, Garruk, Apex Predator will pick off every remaining threat on your opponent’s board if left unchecked, and Ajani, Mentor of Heroes will help you to refill your hand with creatures of any of those planeswalkers or pump up your creatures into very real threats. The biggest advantage this deck has of splashing black is Thoughtseize and Hero’s Downfall. If there is any deck out there that can use these cards to their utmost benefit, it’s Abzan midrange. The deck plays powerful cards, strong removal and disruption, and can absorb the damage from pain lands and Thoughtseize easily. This deck could easily be tier 1 in the future and I expect to see it at Pro Tour Kahns of Tarkir. Still a work in progress, but I think it’s pretty solid. Having access to white, green, and black gives you a lot of options in your sideboard. Drown in Sorrow and Nyx-Fleece Ram makes one hell of a headache for aggro decks, especially against cards like Goblin Rabblemaster. Bile Blight deals with token strategies pretty well, Reclamation Sage deals with enchantment heavy decks like mono black aggro, and Banishing Light is a good catchall against midrange and control decks using a variety of monsters and planeswalkers. The cards I’m not really sure of are Ajani Steadfast and Utter End. Some people said I should be running Deicide to be dealing with gods, but I believe that Utter End is better because it also deals with indestructible cards such as Sarkhan, the Dragonspeaker as well as non-enchantments. Ajani Steadfast was added more as a anthem affect. With the large concentration of planeswalkers and big creatures, I figured he’d be great in mirror matches to give you an edge. Being able to ultimate your planeswalkers after 2 turns seems like a hell of a way to win. Sure you wouldn’t be able to do it with Ajani, Mentor of Heroes, but letting ANY of the other planeswalkers ultimate means bad news for your opponent. If you look back a few months to around March or April, you’ll probably see my original idea this RW Tokens deck (never mind, here it is if you want to see it!) The deck at the time was utter garbage. I eventually added in Journey into Nyx cards a few weeks prior to the Pro Tour, but it still felt like it would come up short. I simply wasn’t getting the card advantage I needed to finish games. 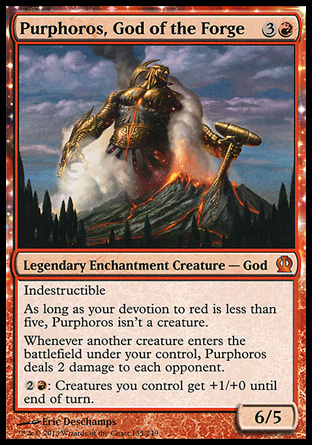 The idea was sound though: Play Purphoros, God of the Forge and then use various token creators such as Brimaz, King of Oreskos, Elspeth, Sun’s Champion, and Hammer of Purphoros to bomb your opponent to death with all their activations. Their was definitely enough burn at the time to finish them off, but I felt like I needed a lot more bodies on the ground. Fast forward to M15, and suddenly I have 2 new friends that fit very well in this deck: Raise the Alarm and Goblin Rabblemaster. This helped not only my curve but also doubled the effectiveness of Purphoros. Stoke the Flames was also added at this point because I finally had enough creatures to use its convoke cost efficiently. It wasn’t until Khans of Tarkir that the final parts fell into place though. Sorin, Solemn Visitor gives you an anthem + lifelink and lets you set up massive armies of tokens without having to worry about being burned out or taking too much damage early on from aggro decks. Of course his inclusion meant adding in 4 Nomad Outposts and dropping the scry lands, but I feel that it’s much stronger now. Hordeling Outburst was also a nice little addition from Khans that works very well with Purphoros as well as Goblin Rabblemaster. Ajani Steadfast further boosts the power of your creatures (permanently I might add), and the recent addition of Spear of Heliod also helps. The last card I decided to add in at the last minute is Launch the Fleet. With Purphoros in play, I pretty much consider this a game ending card after turn 5. Attack with 5 tokens and make 5 more to deal an automatic 10 damage. If I didn’t have to attack to activate this card, it would be a 4 of. Pretty standard sideboard for white and red. We have Anger of the Gods and Nyx-Fleece Rame to handle aggro decks so we have time to set up our boards, Devouring Light to take care of creatures too large to be burned out or blocked effectively, and Banishing Light to deal with anything else (such as Artifacts and Planeswalkers). While I have a Chandra Pyromaster in the main board already, I think it can’t hurt to have another in the sideboard for control match ups against Sultai decks. I also thought that the Goblinside enchantment would be easy to activate with all the the non creature spells I’m playing. Against control, it could be pretty effective. This isn’t the final set up, but just what I’ll be using in the first few weeks of Khans of Tarkir. Saisho gu, Jan, Ken, PON! I expect some crazy decks to come out in the next few weeks and I can’t wait to see what everybody else is using. I’ve already played against a crazy Jeskai storm deck that can win on turn 4, seen a large number of green midrange decks, and I’m sure there will Rabblemasters galore as well. What are you expecting and which decks will you be using in the first few weeks of Khans standard? I’d like to know, as well as to hear what kind of crazy decks you’ve run into. It all begins tomorrow, so I hope you’re ready. Good luck! And I actually liked Brain Maggot Mainboard quite a bit. I was missing some cards so I brought 3 of them in from the sideboard to get to 60 cards and the additional hand disruption was pretty good. I might even do a split between Pain Seer and Brain Maggot Mainbord in the future.